THE FANGO FILES: Introduction – The Foundation Of An Obsession – Schlockmania! Your Humble Reviewer was casually browsing an online forum on December 7th, 2007 when he read the awful news. A warehouse in Oregon, Illinois had burned to the ground after a forklift driver accidentally punctured a gas line located near a space heater. Thankfully, the people inside the building escaped without injury… but the warehouse’s contents were destroyed. And what did this warehouse contain? All the back issues of Fangoria. Documents of a few decades’ worth of horror history were reduced to ashes in a matter of minutes. No one would ever be able to order print copies of those classic issues again. Some genre fans shrugged the news off, saying “whatever, it’s just a magazine” or “doesn’t bother me, I never cared that much for it.” For others, this shock had the impact of an unexpected punch to the solar plexus. Your Humble Reviewer was definitely in the latter group. He hadn’t bought a new issue since the early 1990’s but he remembered a time in his life when Fangoria had been the most important thing on the newsstand. His obsession began in 1987. He’d just become interested in horror movies, cutting his fandom teeth on VHS rentals of Fright Night and Creepshow. Like any new enthusiast, he wanted guidance on where to go next but said guidance was hard to come by. In that pre-internet era, pursuing an eccentric, socially-frowned-upon hobby took perseverance. Finding information on such interests was a hard-won battle. Thankfully, there was one ray of hope for the young horror fan of that era: no matter where you lived, you could always find an issue of Fangoria on a local magazine rack. Each month, it was there to reassure you that other people were interested in the same thing and you weren’t a complete weirdo for being into the genre. Every issue brought the latest news, information on where to find all the good videos/books/mags/etc. and, best of all, articles that explored the genre’s history. It was one-stop shopping. In short order, Your Humble Reviewer built up a collection of issues. Each copy was pored over obsessively and then filed away to become part of his personal horror library. As the years rolled on, his interests broadened into other cult film genres and more magazines were added to that home library: Cinefantastique, Psychotronic, Shock Cinema, etc. However, the Fangoria‘s remained the heart and soul of the collection. They were where it all began. Eventually, his interest in the current horror scene waned and he stopped buying new issues of Fangoria… but he kept the old ones. How could he get rid of them? They were the bedrock of his cinephile interests and they’d always have a place in his fanboyish heart of hearts. 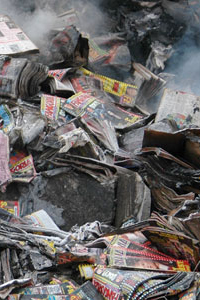 A few years before that fateful warehouse fire, he’d even gone back and completed his collection of the first hundred issues, carefully bagging and boarding each magazine to make it an official archive. The time has come for that archive to be put to use. The Fango Files is going to explore the early history of the magazine on an issue-by-issue basis, covering Fangoria‘s highlights and growing pains during that growth period where it developed from a young upstart into a genre titan. Each entry will be an essay that places the chosen issue into a historical context as it discusses the films, the writing, the trivia and any other worthwhile minutiae. There will also be scans of issue-appropriate images to tantalize the eyes. THE FANGO FILES: Issue #05 – Strong-Armed By Sci-Fi Again! I’m looking foward this! Very interesting. It’s ironic (or maybe not) that you start this now that the magazine is having a hard time (or that’s what I read). In the 90s, I was a faithful reader of the spanish edition and every now and then I use to order some new mag just to take a look at this venerable horror institution. Very observant – all the talk of Fango in horror-fan news put me in a nostalgic frame of mind and inspired this series. Issue 1 will be up on Friday, with some killer scans, so stay tuned! This is a momentous and fascinating feature! I’ll see if your comments mirror my own in any way. I bought Fangoria from issue one and loved it for a few years.